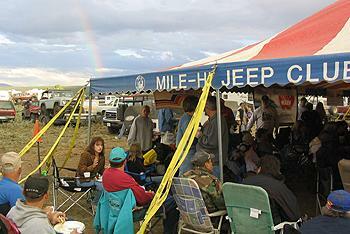 On Friday August 8th, begins the last day of trails of a fun week of jeepin' :( . 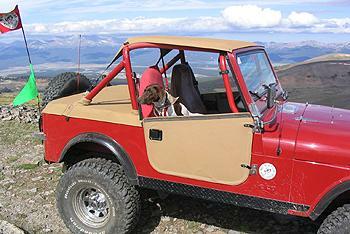 I (along with my jeepin-side kick Molly), led 4 rigs out of the staging area at 8:00am sharp on channel 17. 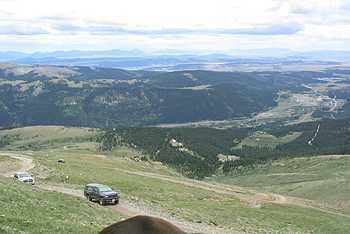 The trip headed up past Leadville and over 13,186' Mosquito Pass, down the other side past Alma, Up to 14,172' Mt. 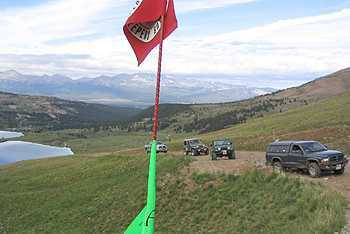 Bross, back thru Fairplay, then back over 11,921' Weston Pass to camp. Nothing real technical, but a lot of scenery in one day. This is the highest trail of the week, and it's the most scenic with it's many switchbacks and views. The 4 Jeepers for the day included: Greg S. (03 Ram-Phoenix, AZ), Mike D. (YJ-Cave Creek, AZ), Ray Jenkins (TJ-Mesa, AZ), & Ray J. 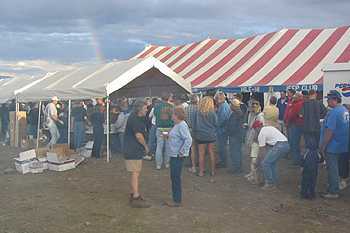 (02 Dakota). A nice small group to be able to stop more, take smaller spur roads, and take in more views. 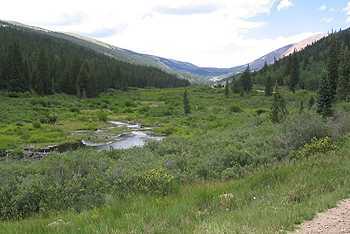 We headed up Hwy 24 north out of camp to Leadville for some gas, then took 4th St in Leadville east to Forest Road 12 and Mosquito Pass. Passing the famous Matchless Mine, where former rich (died poor) Baby Doe Taylor lived out her last days in 1937 once rich, now penniless. 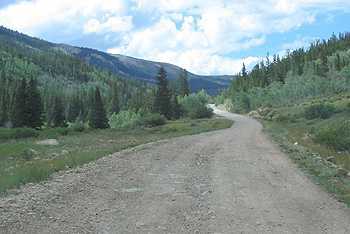 The road is a god county road until just past the Diamond Mine (a recent gold & silver mine). We stopped for a 10-100 at a mine dump, and looked at some of the local ore before being overtaken by mosquitoes. 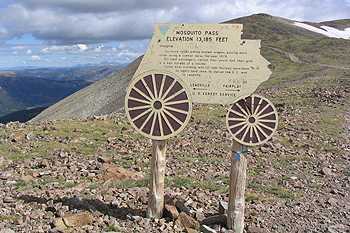 Well, how appropriate, since we were heading up and climbing Mosquito Pass. 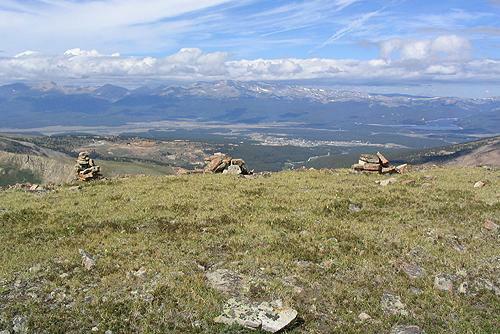 Climbing every higher above 10,200' Leadville I took a small spur road which leads over to some microwave towers and a different view of the area. 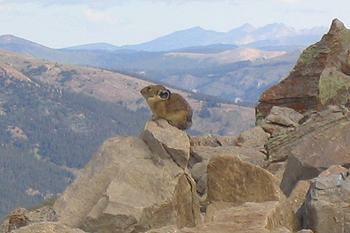 The sun finally shined on the Collegiate Range, and some of the best views in Colorado can be seen here. 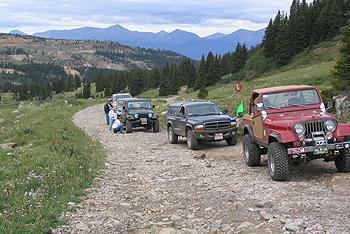 We headed over to Mosquito Pass at 13,186', which is the highest dirt road pass in the country. 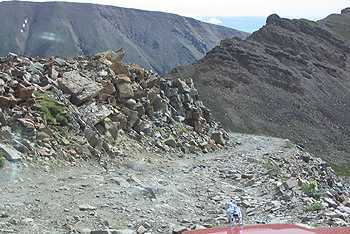 Imogene Pass in the San Juan's is just a few feet lower. The winds were already howling, and they were especially strong at the pass. Once down the other side, they subsided a little. 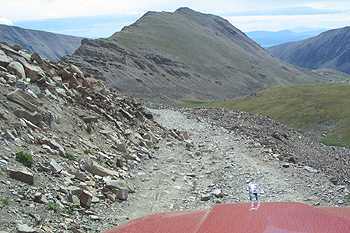 The trail on the east side of the pass becomes a bit more rockier, and gets your attention. 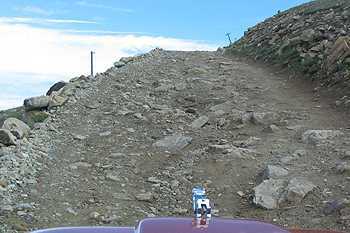 It is also steeper, with fewer switchbacks. 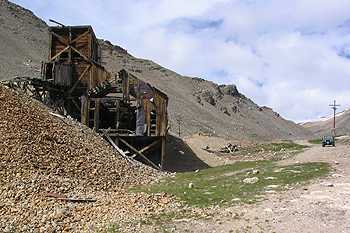 Soon, we made our way down to the New London Mine, and took a break. Trestles and cables carried the ore once crushed from the mine to the New London Mill down the valley below. Where once you could tour the Mill, someone who only owns the mining claims (not access), has put a gate at the entrance to a small road to the Mill, so we moved on down to Alma. 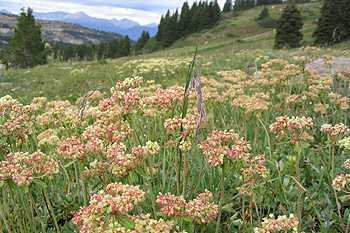 Once at Alma along Hwy 9, between Fairplay and Breckenridge, I took Park County Road 8 up Buckskin Gulch to the trail leading up to Mt. Bross. 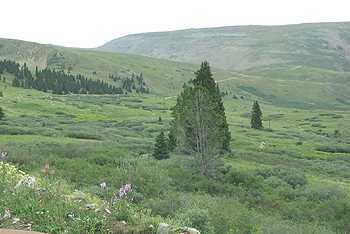 The trail up to Mt. Bross is Park County Road 787. 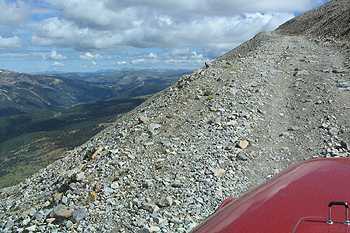 It's an easy trail, and all SUV's can climb it. 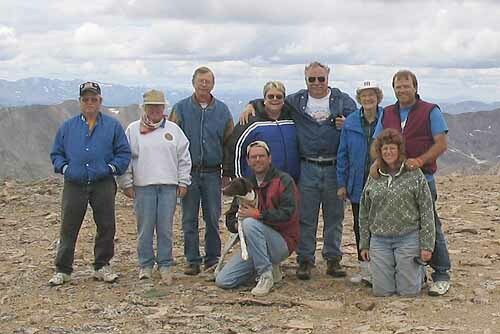 We made it up to Windy Ridge, where we stopped for lunch among the 1,000 year old Bristlecone Pine Scenic Area. 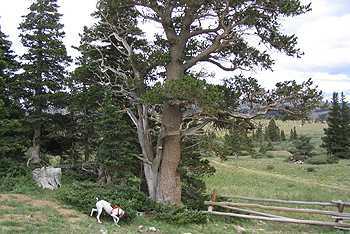 The winds were lighter here, and the old pines were unusually twisted here. 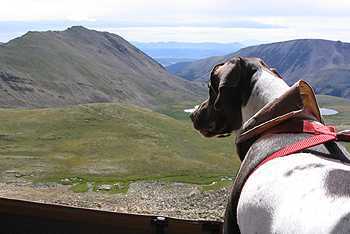 After lunch, were climbed up the switchbacks along the eastern slope of Mt. Bross. 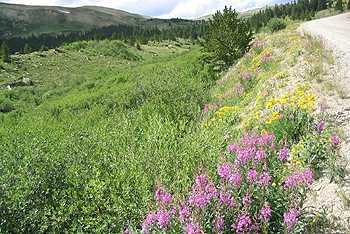 There were some cut-off trails, but we remained on the main trail (please stay on the main trail above timberline in the tundra). Climbing ever higher, the views of the surrounding area began to unfold. Past the Moose Mine near the top, we reached the summit of 14,172' Mt. Bross. It is one of the most unusual peaks, as it almost covers a football field in length. After some photo opps, signing he register, and a group photo, we headed on down as it was becoming about 2pm. 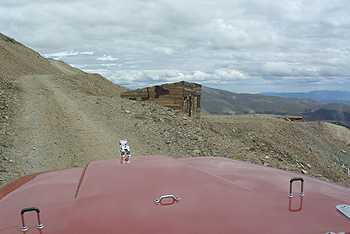 Heading down, we retraced our previous tracks down to the main road back into Alma. Some need some gas, so we stopped at the Texaco south of Fairplay, and headed south on Hwy 285 to the Weston Pass turnoff and Park County Road 5. 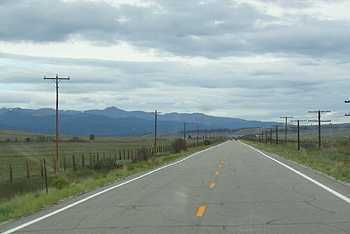 This good country road turns into County Road 22, and slowly deteriorates to get your speed down to a crawl near the top of Weston Pass. 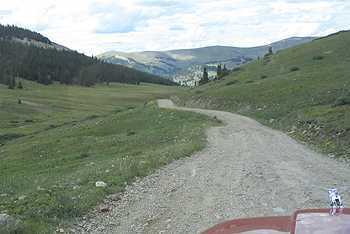 On the west side, the road in Chaffee County is County Road 7 and it is NOT maintained. So, the road (trail) is slow going (unless you have a rental of course). We finally reached Mt. 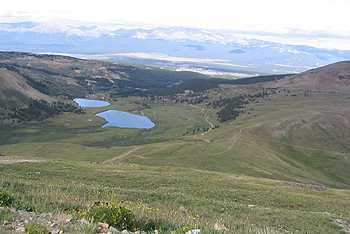 Massive Lakes and Hwy 24. A nice loop trip, I reached base camp around 5:30pm. 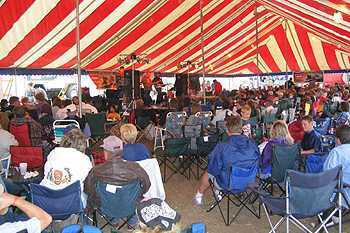 Just about an hour to start packing up and freshening up for the grand finale 'Warn Night' bash under the big top starting at 6:30pm. 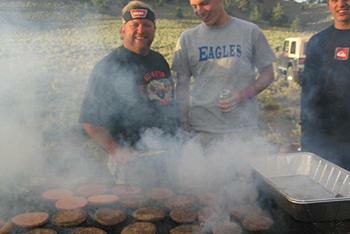 Warn cooked up some hamburgers and hotdogs for all, and also provided refreshments (soda & beer). 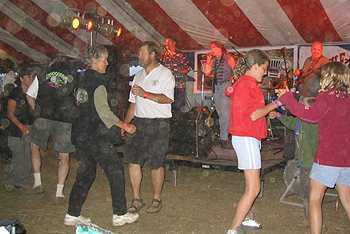 They also booked the same band that has followed All-4-Fun for years, as they started up around 7pm. 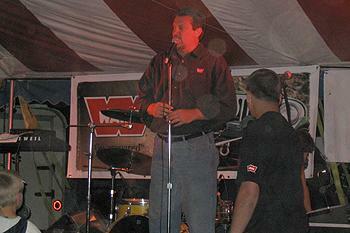 Warn Night is sponsored by Warn Industries. 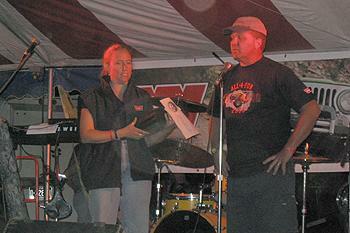 During intermission, Harold Ogden of Warn handed out some Warn products. A big THANKS to WARN for their great support of All-4-Fun! 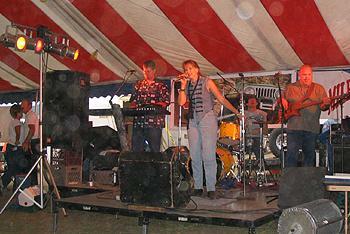 The band (which played last year in Silverton, Salida, Central City, & Fairplay in 99') played on till 11:30pm Friday night!